sportsmatrix » Just How Important are Corner Kicks? When a team wins a corner kick there is nearly always a sense of anticipation in the ground, regardless of the effectiveness of the team’s record at taking corners. What makes the corner kick so special? Perhaps the feeling that however poor a team might be, the corner kick could represent their best opportunity to find the back of the net. There are teams where the chances of scoring a goal increase significantly with the award of a corner kick, whilst for others a corner kick is followed by that inevitable sense of anti-climax. Some teams regard the corner kick as another goal source, whilst there are some teams which are overly reliant on corner kicks for their goals. The SportsMatrix analytics department decided to investigate this phenomena, observing more than 100,000 corner kicks delivered by over 900 teams in 54 leagues from around the world; during the 2015 season for some leagues and for games played in the 2015/16 season up to the end of January 2016 for other leagues. For the purpose of this report, a goal from a corner kick is defined as one that is scored directly following the corner kick or one that follows a rebound or second ball. It does however exclude a goal scored after the attacking team failed to score from the initial corner kick delivery, but scored with the start of a new attacking move. Of all 900 teams examined, the one that averaged most goals per game from corner kicks was Grasshopper Club Zurich from Switzerland. Grasshoppers scored one goal from every nine corners taken and averaged a goal every other game. Of the teams from Europe’s top five leagues, Real Madrid from La Liga and Manchester City from the English Premier League both averaged a corner kick goal once every three games played, with both teams having scored seven times up to the end of January 2016. 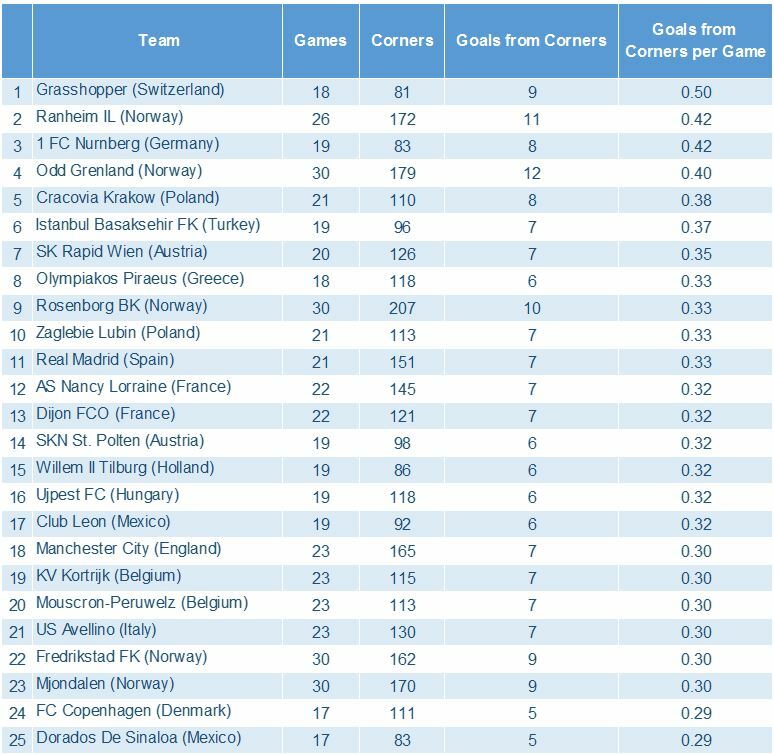 Of the top 25 teams averaging most goals per game from corner kicks, five are from the top two leagues in Norway. To date there are 47 teams yet to register a goal from a corner kick, of these Stoke City, despite being the tallest team in the English Premier League (average squad height: 184.8cm) and having a reputation of being set piece specialists, have failed to score from a corner kick. FC Barcelona may be one of the most imaginative teams when it comes to finding ways to score; but so far they have singularly failed to convert any of their 129 corner kicks into goals. With their 2015 season finished, Club Atlético Sarmiento from Argentina’s Primera Division, failed to register a goal from any of their 149 corner kicks, the highest number of unsuccessful corner kicks of any of the 900 teams surveyed. After looking at which teams were most prolific at converting corner kicks into goals, the next factor was to determine a team’s reliance on corner kicks for goals, by calculating their percentage of goals scored from corner kicks as a percentage of all of goals scored. There appears to be a clear negative correlation between a team’s reliance on corners and their position in the league – Of the top 25 teams from the 54 leagues examined, with the highest percentage of goals from corner kicks as a percentage of all goals scored, only four were in the top halves of their respective leagues (Zaglebie Lubin, Istanbul Basaksehir, Ranheim IL and Ujpest FC). This perhaps suggests that poor teams find it more difficult to score goals from open play and therefore focus more on being effective from their set plays. 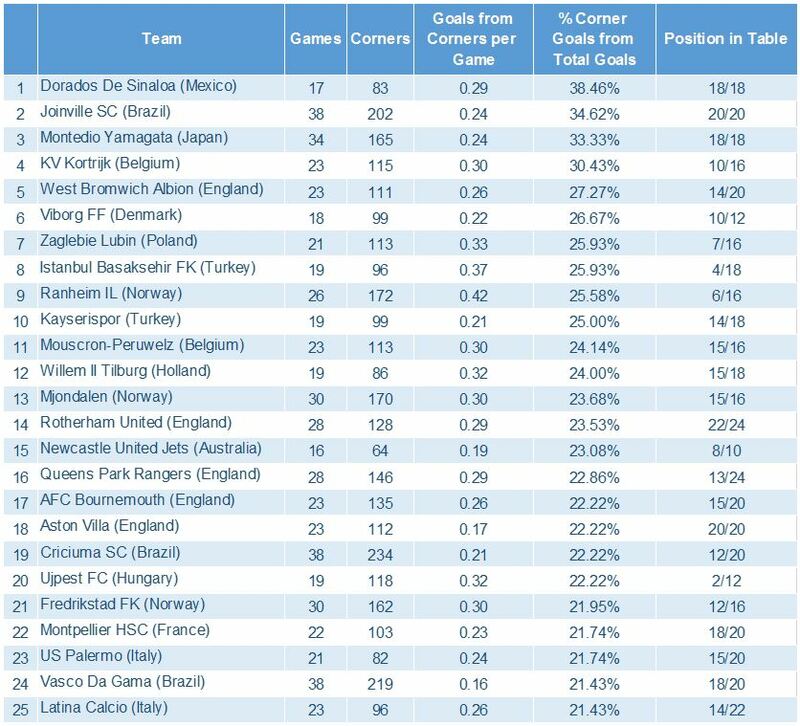 The three teams with the highest percentage of goals from corner kicks as a percentage of all goals scored, were all bottom of their respective leagues, with Dorados De Sinaloa of the Mexican Liga MX also appearing as one of the top 25 teams for goals scored per game from corner kicks. Although each of the leagues was examined separately, it is apparent that there are clear trends between certain countries and regions. By a significant margin, Norway’s top two leagues, the Tippeligaen (Top League) and the First Division (Second League) averaged most goals per game from corner kicks in the 2015 season, perhaps suggesting that Norwegian teams tend to adopt a particular playing style. The Tippeligaen averaged 0.40 goals per game, with 97 goals scored in 240 games, whilst the First Division saw 85 goals scored from corners in 221 games at an average of 0.38 goals per game. On average a goal is scored in the Tippeligaen once every 26.04 corners and in the First Division once every 26.84 corners. Just as the top two Norwegian leagues held the top two positions, in joint fourth place for effectiveness in scoring from corner kicks are Austria’s top two leagues, the Bundesliga and the Ersta Liga, with both averaging 0.33 goals per game. When examining the importance of goals scored from corner kicks as a percentage of all goals scored, the Norwegian second league is ranked first with 13.14% of all goals scored coming from corners, with the Norwegian Tippeligaen in third place (12.53%), whilst perhaps surprisingly Italy’s Serie B is in second place, with 12.73%. The English Premier League is the only one of the top five European leagues to feature in the top 20 for goals scored from corner kicks, with 73 goals scored in 230 games at an average of 0.32 goals per game. The two leagues which stand out for their inability to convert corner kicks into goals are the Romanian Liga (0.19 goals from corners per game) with 30 goals scored from 1,510 corner kicks and a goal scored every 50 corner kicks. But firmly in last place is the Greek Super League (0.17 goals from corners per game) where only 26 goals have been scored from 1,411 corner kicks, at a rate of a goal every 54 corners. Whilst corner kicks provide very few goals in the Greek Super League, goals in general are hard to come by in this league, with on average 2.33 goals scored per game, the fourth fewest of the 54 leagues examined. Qatar (0.20 goals from corners per game) on the other hand saw 21 goals scored from 1,007 corner kicks, whilst averaging a significantly higher 3.13 goals per game, emphasizing the lack of importance that corner kicks play in the Qatar Stars League. Having examined effectiveness and reliance on corner kicks by both teams and leagues; we then examined whether corners were played short or crossed directly into the danger area. Corner kick types are defined as being either direct cross corners or short corners. A direct cross corner is one knocked directly into the penalty area. A short corner includes all other types of corner, including a short pass by the taker or a longer pass to a teammate outside the penalty area, before the ball is delivered into the penalty area. It also includes a corner from which passing move develops before the ball is delivered into the penalty area. 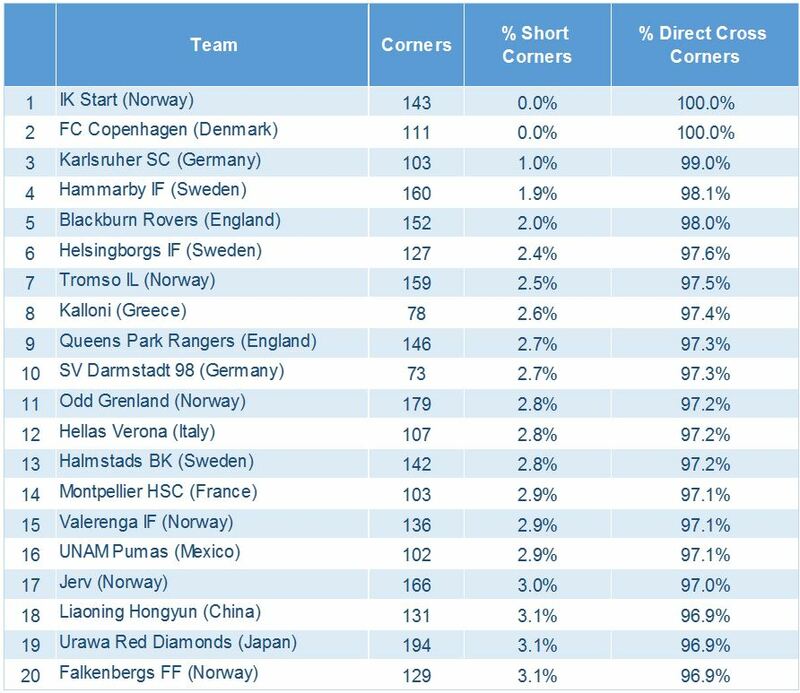 Not only do the Norwegian leagues rely heavily on corner kicks for providing goals; but delivered the lowest percentage of short (and highest percentage of direct cross) corners. Of the 2,281 corners delivered in the Norwegian First Division (Second League), 2092 were direct crosses, with the remaining 189 played short. The Tippeligaen ranked third, with 90.4% of corners delivered directly into the penalty area. Sandwiched between the two Norwegian leagues and perhaps highlighting some sort of geographic correlation, is Sweden’s Allsvenskan, with 2,321 of the 2,542 corners delivered directly into the penalty area. However, unlike their Norwegian neighbours, the Swedish teams persist in delivering direct crosses, despite being ranked one of the worst five leagues in terms of converting corners into goals (0.22 goals scored per game from corner kicks). In some countries a commonality in style of corner kicks exists between the first and second leagues, with the Campeonato Brasileiro Serie A and Serie B delivering almost identical percentages of short and direct cross corner kicks, again signifying that corner kick styles are often the same within national boundaries. Maybe it should come as no surprise that the two leagues delivering the highest percentage of short corners are the two European leagues with the most technically gifted players. Out of 2,118 corners taken in Spain, 454 were taken short, whilst Italy’s Serie A topped the league for short corners, with 23.5% taken short and 76.5% crossed into the penalty area. IK Start from Norway, who survived relegation from the Tippeligaen at the end of 2015 season thanks to victory in the playoff, failed to deliver any short corners during the entire season, with all 143 corners crossed directly into the penalty area. FC Copenhagen from Denmark, who averaged a high number of goals per game from corner kicks, were only other team to deliver 100% of their corners (111) directly into the penalty area. The preference of Scandinavian teams to deliver crosses, rather than take short corners is also apparent, with 10 of the 20 teams featured in this list coming from Sweden, Norway and Denmark. The Swiss Super League not only boasts the team averaging most goals per game from corners (Grasshopper Zurich), but also the team (FC Lugano) delivering the highest percentage of short corners and one of only two to deliver a higher percentage of short than direct cross corners. Lugano persevere in delivering short corners, despite their only goal from a corner kick being scoring following a direct cross corner. FC Krasnodar from the Russian Premier League are the other team to deliver a higher percentage of short over direct cross corners, with marginally greater success and with both of their goals from corners coming from short corners. 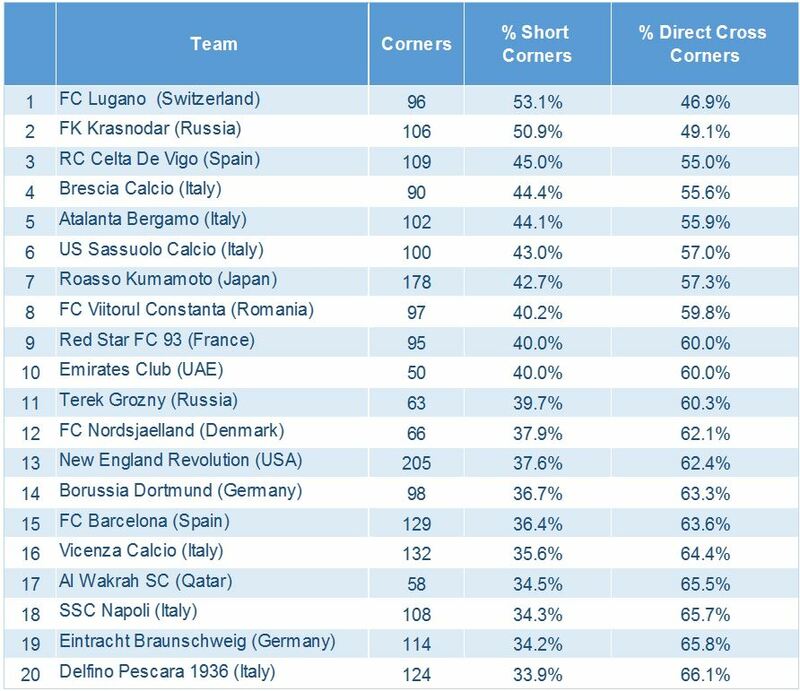 Of the teams delivering the highest percentage of short corners, three European giants, FC Barcelona, Borussia Dortmund and SSC Napoli appear in this list, with each at or close to the top of their respective leagues. « Is Confidence the Main Reason Christian Benteke is Suffering in Front of Goal?